Unlike most of our competitors, we offer much more than the shell schemes themselves. We have the facility to completely project manage the event and full shell schemes. Yes, everything! The carpet, walls, graphics and furniture through to shell scheme conferencing and AV. Even podiums and back drops. 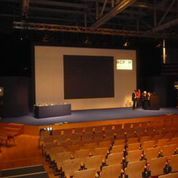 We can design and also build your conference back drop to meet your client’s expectations. Interactive digital signage allows your visitors to find the information that they want quickly. It’s also great for getting your visitors to engage with your event. We welcome a face to face meeting to discuss your requirements in more detail. As well as allowing us to explore the venue’s potential. To discuss your event in more detail please call us on 01793 613088.